On a remote tepui in the Guayana highlands of southeastern Venezuela, a group of explorers (led by “Ken”) trek deeper and deeper into the uncharted wilderness. Ken hopes to make the discovery of living dinosaurs inhabiting the dense jungle. What they find instead is a large alien creature, seemingly made of wood, and wielding a bizarre device. Before the explorers can flee, the wood-creature zaps them with the device and they vanish. Down in the abandoned subway alcove, Don, Raph and Casey put the finishing touches on the old armored car. Don turns the ignition and gets the motor running, but fills up the room with rancid exhaust smoke in the process. The trio flee from the fumes, but still find time to celebrate their hard work. At the U.S. Air Defense Headquarters, radar technicians report signs of a large bogey lifting off from the dark side of the moon and heading with purpose toward New York City. The military scrambles all its forces in response to the incoming invaders. At Kurtzburg Hospital, a doctor shows Michelangelo out through the facility’s secret exit and gives him a reentry card in case he or his brothers are ever hurt again. Raptarr offers to give Michelangelo a lift home and the two take off to the skies. Out in Earth’s orbit, smaller Utrom craft encircle the larger cylindrical ship and prepare for descent into Earth’s atmosphere. The lead Utrom tells his subordinates that under no circumstances are they to return fire to any attacking military craft. The large robot tells the Utrom that he’s done all he can and everything is up to the humans, now. In Northampton, Shadow rides her dirt bike home from the old farmhouse to Stainless Steve Steel's farmhouse. She had a good time with Jay and wants to introduce him to her family, but feels like doing so might ruin their relationship. As soon as she gets home, Splinter calls her into the living room to watch the news. A reporter is on the scene in New York City, where the Utrom crafts are slowly descending. Panic has gripped the city and militant organizations, in fear of “alien invaders” have begun attacking the local superhero population in. That includes Raptarr and Michelangelo, who are being fired upon by the Madhattan Maulitia. Seeing this on the news fills Splinter and Shadow with concern and Splinter suggests that Shadow call April and Casey. 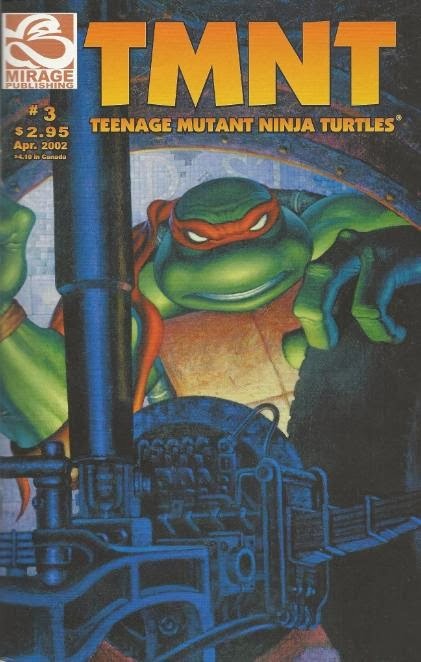 Down in the subway tunnel, Don, Raph and Casey drive the armored car along the tracks, onto the platform, up the stairs and out into the streets. Upon reaching the surface, however, they find the city in a state of panic, as people are running through the streets in terror. As the Utrom crafts breach the atmosphere, several Air Force jets engage and launch a volley of missiles. Forcefields protect the crafts from attack, leaving the military helpless to stop their descent. Elsewhere in New York, April has no idea why the city is in an uproar. She attempts to call Shadow on her cell phone, but can’t get a signal. She looks up into the sky and sees the craft preparing to land. The large cylindrical craft comes down in New York Harbor, near Liberty Island, creating an artificial island. *This story is continued from TMNT (Vol. 4) #2. The story continues in TMNT (Vol. 4) #4. *The news reporter references the events of September 11th, 2001 as having occurred “last September”. Tales of the TMNT (Vol. 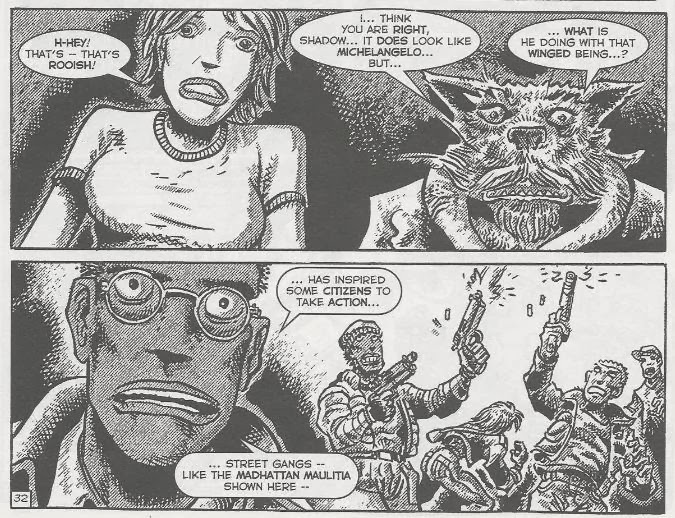 2) #66 occurs on New Years Eve and takes place almost immediately prior to the events of Volume 4. With those clues in mind, that would place the events of Volume 4 in January of 2002 (so close to "real time" for when the volume began publication). *Raptarr will appear next in TMNT (Vol. 4) #15. So that’s a pretty big shift in the status quo. 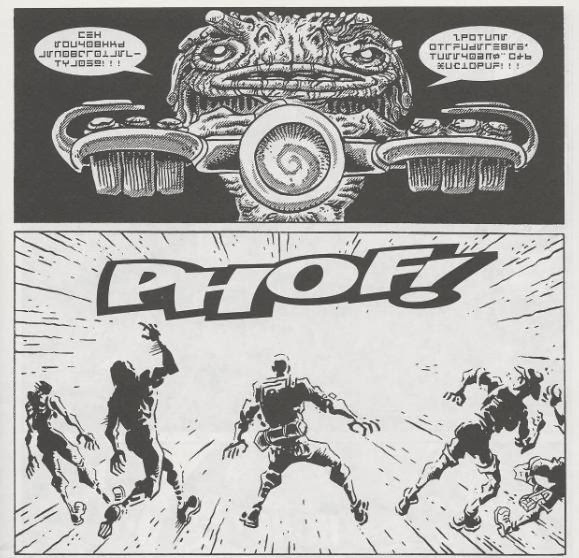 To be honest, while I’m itching to talk about the Utroms making the presence of aliens known to humanity, I think I’m better off waiting until the fifth issue for that discussion. That’s when the big change actually occurs and this and the next issue are sort of just the build up toward that massive upheaval. This was a pretty damn thick issue, by the way. We’re talking 48 pages and still at the regular price of $2.95. Hey, love or hate Volume 4, you got a pretty good bang for your buck. The increased page space gives the issue time to initiate some new plot threads, most notably the one involving the explorers and the wood-creature. The ball is rolling now, but it’ll be a while before that arc truly kicks off. And once it does… Now, I may be misremembering things since it’s been a few years, but man, that was an arc I thought would NEVER end. There’s also the whole deal with the armored car. How… exciting? Is that the word for this 3-issue arc involving repairing an old truck? “Exciting”? Yeah, okay, sure. I was on the edge of my seat as Donatello topped off that battery, Casey de-gunked that engine and Raphael tightened the nuts on those tires. Three issues, everybody. Three issues. As Michelangelo checks out of the Kurtzburg Hospital, there’s this inanely protracted scene as he and the doctor make tedious small talk. The doctor tells Michelangelo all about the hospital’s painkiller prescription plan, explains how their security access system works, ponders the authorization process necessary for getting the other Turtles access cards, exchanges e-mails with Mike… Jeez, it really is a lot of unnecessary babble. I think Laird was really, REALLY proud of this Kurtzburg Hospital idea and wanted to regale readers with all the intricacies about how it functions, but it’s just a frustrating waste of time that has no payoff. Do we REALLY need to know that Michelangelo and the doctor will be updating their security access and medical coverage via e-mail? Was that 3 pages well-spent? 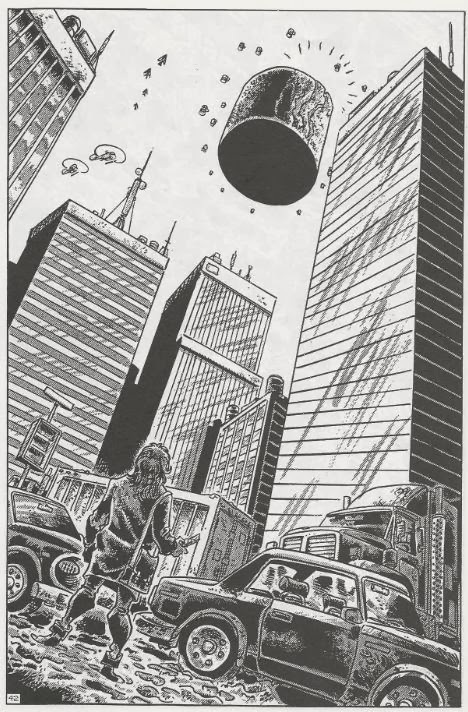 The real highlight of this issue is seeing New York react to the Utrom craft coming in for a landing. Again, it references what the past two issues have been reminding readers regarding the Mirage universe; that superheroes are common and plentiful and the general population knows all about them. So you see the Madhattan Maulitia freaking out and opening fire on anything they deem abnormal, including one of those superheroes, and it does feel like all that foreshadowing and “reminding” finally paid off. It’ll come into relevance even more so in just a couple issues, when the Utroms finally extend their hands/tentacles to the population of Earth to accept cohabitation with aliens as well as super-beings. This issue is another exercise in excellent plotting gutted by a tedious execution, but that’s Volume 4 in a nutshell and I don’t think I want to make that observation over and over again for the next 28 reviews. A lot of cool things happen in this issue, but you wouldn’t know it just by reading it.